Working mothers in South Korea work fewer hours than fathers on average, the latest government data showed, a phenomenon that carries deeper patriarchal significance of role imbalance at home. 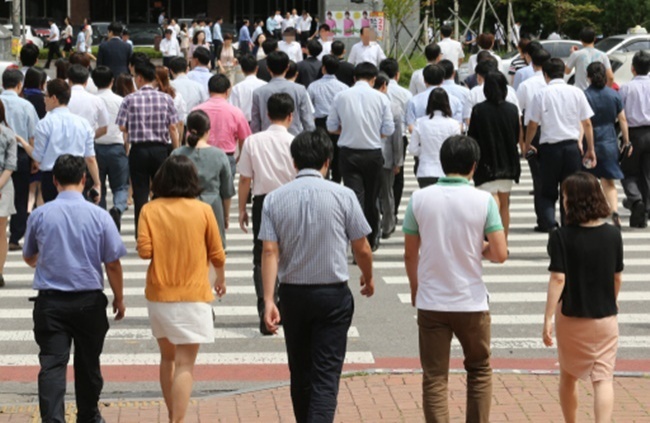 Employed South Korean fathers work an average of 8.6 hours more than their female counterparts per week, according to the data from Statistics Korea last week. But experts say the figures only tell half the story, as many South Korean women are being held back from making career choices freely and compromise for home responsibilities more often than men. The gap doesn’t consider that women are largely taking care of children, says Moon Yoo-Kyung, a senior researcher at the Korean Women’s Development Institute. “When you work full-time in South Korea, it’s unlikely that you’ll clock out of work at 6 p.m. on the dot, which leaves you with few child care alternatives,” Moon said. South Korean mothers do house chores for nearly three and a half hours per day, according a study by the Seoul Foundation of Women & Family in 2017, while fathers spend around an hour doing housework. The study also revealed women have less time to sleep, eat and rest. Data from the Organization for Economic Cooperation and Development last year also showed South Korean husbands spend the least time doing housework among OECD member states, followed closely by Japan. “One of the biggest reasons (behind the figures) is that women do the housework that men don’t,” says Shin Kwang-young, a professor of sociology at Chung Ang University. Against this backdrop, professor Shin says pressing issues facing South Korean society, such as low birthrates, marriage rates and divorce rates, are worsening. Local governments across the country are offering child benefits to encourage pregnancy, such as Yeoju, Gyeonggi Province, where families with three children can claim 10 million won ($9,000). But experts say the culture needs to change to effectively tackle low birthrates and marriage rates. “There are problems between couples at home, as well as the patriarchal mindset among employers in the workplace. There is also a culture in every corner of South Korean society that sees assigned gender roles and different treatment of men and women as the norm,” Shin said. Things are, however, seen to be changing at home, particularly among young working parents. In a recent study by the Korea Institute of Child Care and Education, nearly 9 in 10 unmarried men and women said they believe couples should share housework equally. Progress appears slow in the workplace however, as South Korean corporations are heavily owned by older men with an old-fashioned way of thinking. “The big housework gender gap is caused by not only long working hours, but also a corporate culture where fathers face ‘penalties’ when they leave work on time,” said Moon.